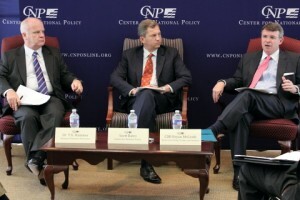 I had the privilege of today attending a debate at the Center for National Policy on “Asia and the Future of American Strategy.” (the audio and video are included in the link and I encourage readers to check it out). It featured friend of the forum Cdr. Bryan McGrath (Ret. ), Dr. T.X. Hammes, Col, USMC (Ret. ), and free cookies. Dr. Hammes described the occasion for the debate as the dearth of strategic thinking over how the U.S. would actually prosecute a war against China should it find itself in the completely undesirable position of being in one. He said the “Pivot to Asia” had not been accompanied by deep strategic thinking, and that misunderstandings over the Pentagon’s “AirSea Battle” has “sucked the air out of the room” for that discussion. To the point, over at the Brookings Institute this morning, the Chief of Naval Operations, Adm. Greenert said that AirSea Batte is “a concept, a way of thinking things through, a conceptual approach to establishing access.” In other words, something closer to a Sun Tzu-esque guiding principle than a fully fleshed-out strategy. With the Pivot, the spotlight is on Asia. 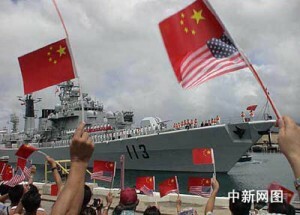 With the AirSea Battle the U.S. knows the main actors it intends to cast. But they roles they’ll play, and how they’ll work together are unclear. Dr. Hammes laid out a summary of the thesis of his article “Offshore Control: A Proposed Strategy, available in the Infinity Journal. He argued that by building defensive capabilities and defensive alliances along China’s first two island chains, from Japan through Malaysia, and focusing on a war of economic attrition (establishing a maritime exclusion zone, and conducting maritime interdiction ops and submarine warfare to enforce it) the U.S. could forgo the need to develop and deploy deep-strike penetration capabilities. This would, in the event of a conflict, help negate the Chinese focus on anti-access/area-denial by effectively ceding the areas within their range (for the time being) and establishing “offshore control” to bring the Chinese government to the negotiating table. There is much merit in this approach, and I am thankful for the bold attempt at a strategy. I plan on taking up the gauntlet thrown down Dr. Hammes in a more in-depth post – if not to develop my own divergent strategy, then to at least hopefully help move the discussion forward. To deter, defeat, or bring together. 1. Dr. Hammes took as a starting point that the U.S. has been drawn into a war with China, and from there proceeded to list the ends, ways, and means to bring it to a conclusion. The means derived from this strategy were primarily those that would support the defense of the island chains and prosecute the economic war. But are these the same means one would develop if the mission was focused instead on deterring war? Bryan’s main point of divergence was along this line, as his core concepts: “Presence, Assurance, Deterrence, Power,” may be better served by the higher-end assets Dr. Hammes hopes to cut to find cost savings. In a stand-off over any particular piece of rock, is China more likely to begin a conflict if it (or a over-ambitious on-scene commander) believes it can forcefully seize the immediate objective? The tools that would allow the U.S. to win a long, drawn-out conflict are not necessarily the same as those that would effectively deter it from beginning in the first place. The difficulty of determining this lies in the difficulty of determining how China would enter into a conflict with America. Most probably it would not be a decision so much as a stumble – a minor squabble with an American ally that through human error ends in bloodshed and a refusal to back down. But there are many possible variables. 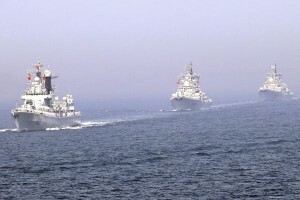 So if China didn’t think it was entering into conflict, the knowledge that America had an effective strategy for ending it on its own terms might not deter China – but then again neither might a nearby aircraft carrier if China doesn’t expect it to come to the aid of a beleaguered friend. It is unclear how a face-saving measure would be possible if the dispute begins with a territory grab, short of allowing the Chinese to maintain their new possession. Sure, there’s room for clever diplomacy, perhaps both sides agreeing to submit a claim for international resolution, but a focus on limited capabilities to serve limited aims removes the ability to enact higher psychological costs (letting the population see the full impact of war), if it continues to push the government to not back down from the initial claim or cause of the conflict. This is not to say it’s not worth the trade-off, or that strikes “going downtown” would be productive, but as Bryan pointed, the benefit of the option should be considered before it is given up. 3. The importance of allies and world opinion plays a heavy role in this strategy. While the U.S. can supply hardware, maintain bases, and jointly operate all it wants with its allies in the region, when the chips are down, it will come down to the specifics of the conflict to determine which way the allies go. The economic consequences of cutting off trade with China will be economically disastrous for not only America and China, but America’s allies as well. As Dr. Hammes admitted, China’s strategy is to attack America’s alliances, so you can bet it would try to exploit reluctance to fulfill military commitments. It may be hard for South Korean leaders to risk their nation’s military, economic livelihood, and subsequent constituents’ ire over a conflict escalating from a fishing dispute in say Malaysia. 4. Similarly, the backlash against the U.S. from friends and partners around the globe could be immense if the U.S. loses the public relations battle over the necessity for the economic disruption. There would be hostility at the intrusive enforcement no matter the length, and its legality would be questioned as there would be no Security Council resolutions since China is of course a veto-wielding member of the Security Council. The need to interdict overland routes in South East Asia in countries unwilling to sign on to the effort could also pose enormous challenges. It is unclear how the U.S. would be able to maintain its position for long if the end does not appear in the near-term, but much again depends on the circumstances. 5. U.S. domestic pressure may become equally, quickly tired. If it is “only” an ally that has suffered a lose of territory or lives there may be a temptation to cut our losses. I would not be surprised to hear voices ask “is it really worth it?” This could happen no matter the strategy, but could be magnified if the fight is portrayed as passive. Conversely, if the lives of Americans have been lost there could be enormous pressure to “go downtown” from the start, and again especially if the pace of the conflict were to drag. What may start as a calculated strategy to maximize American defensive advantages could be turned into a campaign of power projection by overwhelming domestic pressure, only without the capabilities to do it effectively. 5. Lastly, the enemy gets a vote. Part of Dr. T.X. Hammes’ strategy includes broadly advertising both the defensive nature and general concepts of the plan. While Kurt Albaugh in an earlier post on LCS talked about the benefits of clarified intentions, the Chinese would nonetheless begin to focus their efforts on developing effective counters for the strategy and strive to keep them far from the public eye. This is a great start to thinking about our strategic posture in Asia. Despite the above criticisms, I found much to commend Dr. Hammes’ strategy. To their credit, Dr. Hammes and Bryan both admit they don’t have all the answers, and I’ve shown so far I only have questions, but I look forward to the continuing discussion. One thread of the conversation I found very interesting was the debate regarding the efficacy of a “distant blockade.” Many times, Dr. Hammes and CDR McGrath referenced the United States’ victory in the Pacific War against Japan. The question of what prompted Japanese surrender has caused much spilled ink over the years. While middle school history textbooks emphasize the atomic bomb, some very smart scholars such as Robert Pape argue that unrestricted submarine warfare played a much larger role in pushing Japanese leaders towards surrender. If the blockade was indeed more effective than the bomb in heralding V-J day, that would support Dr. Hammes “Offshore Control” strategy. The answer during the Cold War was simpler. Keep arming the allies you have and deter the others. The economy and global attitudes doesn’t allow that luxury any more. While troubling that the US political situation could merit giving up declared defense treaties, it’s understandable. One would hope that in a legitimate international crisis of defense (i.e. seizure of territory and/or citizens), allies would be assisted, but that’s the price any country pays for being unable to mount a “credible defense” in their own right. So be it. What’s also troubling is that we have not advanced very far in seeing that the balloon is starting to go up – and take actions to deflate. While selective in nature, the comments by some Chinese or sympathetic parties in forums such as ID are fascinating at best. The RP would take the first shot over the Shoals? Sounds like war-mongering at a shallow level. This is how the Falklands erupted – the Argentines never thought the UK would sail halfway round the world for what they saw was a bunch of rocks and sheep and decided this was a great distraction to a bad economy, and the UK didn’t believe that reducing an already token defense force on the islands made others think they lacked fortitude and willpower to take action. It’s all about miscalculations, and I’m really beginning to see it happening at a public and tactical level. What more so at the strategic I wonder? The Pivot to Asia could be the cascade event in the failure chain or at least a contributing factor.